working memory, decision-making, executive functioning in those with learning disabilities related to ADHD. For people with motor impairment, the DynaVision equipment can be used to increase the active upper extremity range of motion and coordination, both muscular and physical endurance and improve motor planning. If you are suffering from poor focus and / or multitasking, DynaVision can help. What medical benefits does DynaVision visual training provide? The Dynavision equipment is a medical device with a history largely based on sports performance enhancement but even more based on concerns regarding neuro visual rehabilitation of stroke and brain injured patients. It has been used to train brain injured patients to improve hand eye coordination for over 15 years. It has been successfully used to treat people with stroke, brain and spinal cord injury, orthopedic injury, developmental delays and other neurological conditions. What medical benefits does Cognisens visual training provide? Cognisens NeuroTracker is extremely well suited to treating seniors with normal age related cognitive degradation and can help restore attention after receiving any neural trauma. Consider those seniors who are required to take their driver’s license exam to keep their license so they don’t lose any freedom. Cognisens can help those seniors retain their licenses and ensure a good quality of life. The NeuroTracker is also a great treatment for those suffering from ADD (Attention Deficit Disorder), ADHD (Attention Deficit Hyperactivity Disorder), or Autism. Zone Performance utilizes the most advanced cutting-edge technology in Biofeedback, Neurofeedback, and Perceptual-cognitive training to help Alberta students reach their academic goals and achieve personal success. Peceptual-Cogntive training machines like the Cognisens Neurotracker and Dynavision D2 Vision Board both provide the optimization of focus and attention in those with learning disabilities related to ADHD. NeuroTracker is a breakthrough neuroscience technology for improving attention. Developed by Dr.Faubert at the world-leading Visual Psychophysics and Perception Laboratory at the University of Montreal, NeuroTracker uses 3D multiple object tracking to isolate and train cognitive skills that are most challenging for people with ADHD. NeuroTracker is also used by top sports teams in the NFL, NHL and EPL, and elite US special forces to push attention skills to the limits of human performance. 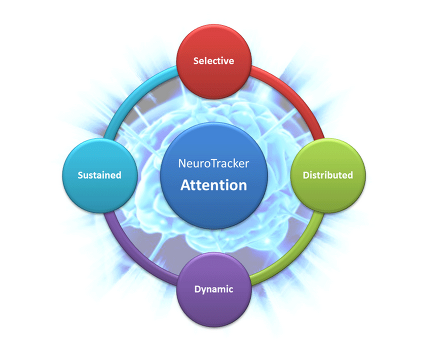 NeuroTracker enhances mental focus, concentration and awareness by training four different forms of attention. These high-level cognitive abilities are improved at a fundamental level so they can be applied in any situation. View the presentation below to find out more. NeuroTracker sessions take just 3-5 minutes each, providing isolated stimulation for rapid brain development through the effects of neuroplasticity. Improvement rates for everyone are dramatic and long lasting – with a wide range of day to day benefits. ADHD and ADD can cause problems in all aspects of life and affects people of all races, social classes and different ages. Day to day skills like time management, planning, organization, memory, awareness and decision-making are often negatively influenced. Overcoming the challenges of ADHD from early school years, through working careers and for socializing throughout life can be a struggle. But attention is trainable, and NeuroTracker is a powerful tool for building up the mental resources fundamental for attention. And better quality of attention, means better quality of life. NeuroTracker enhances attention using scientifically validated training methods to improve mental performance in the ways that matter most for people with ADHD.